Virtual bulletin boards provide opportunities for collaborative brainstorming in real-time. Two different virtual bulletin boards I’ve looked at include edistorm and Wallwisher. Like the bulletin board that hangs on your office wall, both platforms allow you to post sticky notes and rearrange them. In the virtual space, these basic capabilities can be parlayed into opportunities for learning. Some of the features of edistorm and Wallwisher are listed below. Both are likely to evolve. Both sites offer support and access to a blog for providing feedback and asking questions. The edistorm platform allows you to provide feedback directly on the virtual bulletin board you’ve created (the “storm”). You can provide feedback to Wallwisher as well using their “Contact Us” page. You can also use Twitter to keep up with news about edistorm (@edistorm) and Wallwisher (@Wallwisher) and can provide feedback via Twitter as well. Have other ideas? Add them to the “Storm” I created using Edistorm. As tools for intentional learning, virtual bulletin boards are great for allowing students to question, organize information (in small bits), and to identify relationships (by changing the proximity/color of notes, for example). It’s also a great tool for reflecting. However, an instructor can facilitate the problem-solving uses to which these platforms are put. In this regard, the ability to link to content using Wallwisher is an advantage. 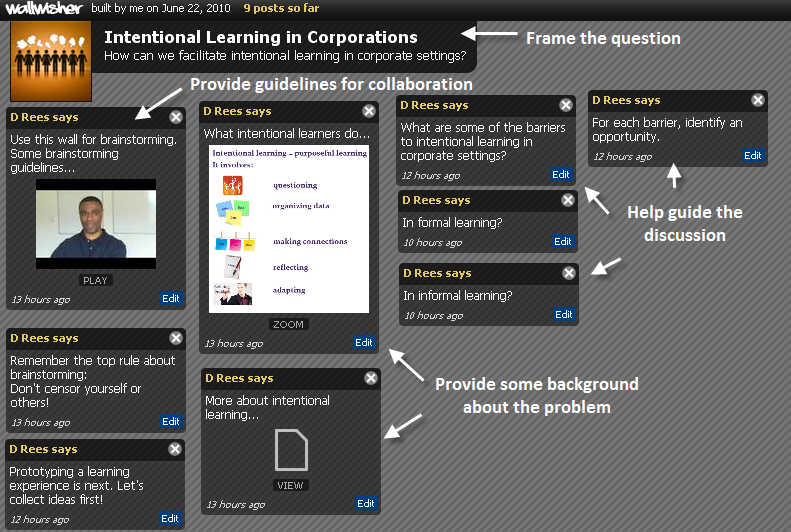 See two different virtual bulletin boards I created to seek input on the same problem: facilitating intentional learning in corporate settings (edistorm vs. Wallwisher). I intend to use edistorm as a rapid brainstorming tool. It’s mindmapping plus, in that I can readily see connections between my different notes and can reach out to fellow instructors to for feedback and ideas. I’ve used Wallwisher before to outline course content. Its linking feature allows me to collect my resources using the wall. Like edistorm, it’s also a great way to collaborate. I don’t really see one tool as better than the other; both have advantages in different contexts. This entry was posted in intentional learning, virtual bulletin boards and tagged brainstorming, bulletin boards, collaboration, edistorm, social learning, sticky notes, Wallwisher. Bookmark the permalink. I’m also using edistorm to jot down ideas on blog topics. What are your favorite personal uses for these tools? An update: You can now copy links (complete urls) on an edistorm sticky note. Clicking on the link will open a new browser window so you can readily go back to your storm. You can also add images and videos on Edistorm. We”ve also added some fantastic reporting features for the classroom that allows for individual user assessment. Furthermore, storm embedding is coming soon.